Build early literacy and celebrate the wonder of winter, snow, and ice skating! 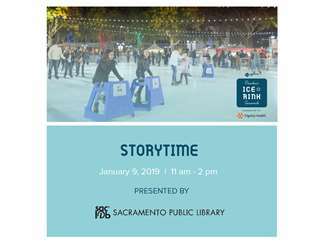 Downtown children’s librarians, Mr. Nate and Miss Caitlin, are bringing storytime to the ice rink during the second Wednesday of every month (Nov. 14, Dec. 12 and Jan. 9), presented by Sacramento Public Library. Designed for babies, toddlers, preschoolers and caregivers, enjoy singing fun songs and reading cool stories from 11 a.m. to 12 p.m. followed by private skating until 2 p.m. when the rink opens to the public. A great opportunity to enhance your child’s early learning experience and avoid the crowds, storytime is free to attend (non-peak skate pricing applies). Early literacy is everything children know about reading and writing before they can actually read and write.